517 West 25 St. N. Y. First there was Blake & Mahoney, then there was Blake and McMahon, and then there was Blake & Duffy. An Irish theme indeed: the center piece of which was John Blake. In 1870 John Mahon lived at 82 Laight St., New York City, and John Blake lived next door at 84 Laight St. Ten year earlier (1860), John Blake and John Mahoney were partners in the "junk" business at 90 Laight St. This John Mahoney was doubtless the John Mahon of 82 Laight St. in the 1870 Census. The business, Blake & Mahoney, remained "junk" from 1860 to 1872, but created a branch office at 137 Barrow St. in 1871. This is described in Trow's New York City Directory of 1873 as "iron, 137 Barrow, & paper, 90 Laight." 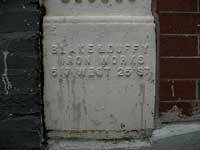 Blake & Mahoney stayed together as either "iron" or "metals" at 137 Barrow St. until 1883. Meanwhile, Blake & McMahon & Co. "iron" sprang up at 519 W. 25th St. in 1878. McMahon was Thomas McMahon, who was recorded in the U. S. Census of 1880, age 50, living at 156 E. 28th St., Manhattan. John Blake continued in business with both Mahoney and McMahon until 1884, when 137 Barrow St. became Blake & Co., and 517 W. 25th St. became Blake & Duffy. Duffy appears to be Francis Duffy, (1859-? ), who practiced law initially (early 1880s), and who came to describe his profession as "iron" in 1885. Blake & Co. became M. J. & M. Blake (Mary J. & Michael Blake) in 1895, then closed in 1898. Michael Blake's entry in the U. S. Census of 1900 states that he was an immigrant from Ireland in 1885. Living with him at the time was a cousin, Mary Blake, born New York, 1854, who might have been the Mary J. of M. J. & M. Blake. Mary Blake might also be the daughter of John Blake. Her age corresponds to the Mary Blake, age 5, who was John Blake's daughter in the 1860 U. S. Census. 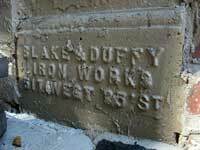 The cast-iron at 430 W. 14th St. is extensive, and there are at least half a dozen foundry marks. The building stretches the entire block from 13th St. to 14th St. along the east side of Washington St. The Gansevoort Market Historic District Designation Report (New York City Landmarks Preservation Commission (2003), pg. 221) gives the following information on 428-432 W. 14th St. (aka 859-877 Washington St. & 427-429 W. 13th St.): "Date: 1887; Architect: James W. Cole; Builder: John Jordan; Original Owner: William Astor; Type: Market building; Style: Queen Anne; Stories: 5; Facade Materials: brick, stone, cast-iron storefronts, metal canopies." The building at 19 Jay St., like 53-55 Little W. 12th and 430 W. 14th St. appears to have been erected in 1887/88. 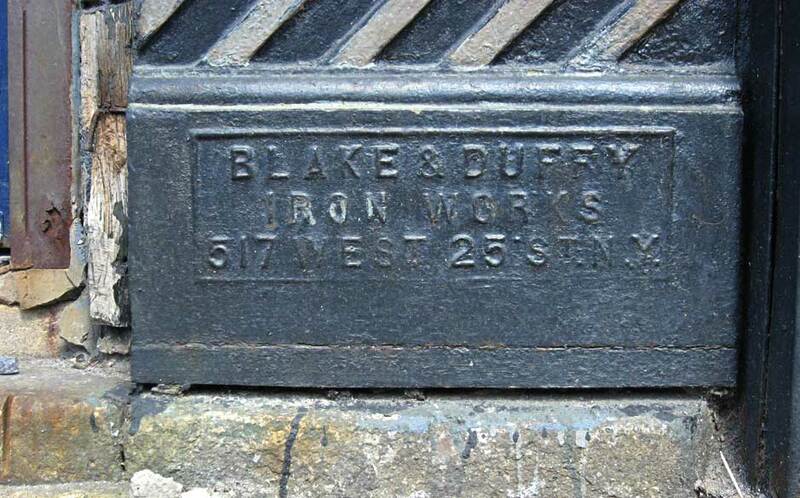 All of these Blake & Duffy cast-iron facades consist of one-story shop fronts on masonry buildings. 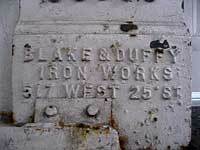 Blake, McMahon & Co. and Blake & Duffy also created iron with the mark Fulton Iron Foundry. For these marks see the Fulton Iron Works page.